Why do we ever even eat nachos without turning them into chili nachos?? It's so much better!! This is the ULTIMATE chili nachos recipe, loaded up with beefy chili, white queso, guacamole, sour cream, and corn salsa! It is the best game-day food ever! Start, of course, my making The Best Chili Recipe I've Ever Made. This recipe is different from most because it uses beef chuck instead of ground beef. It is melt in your mouth delicious! Any homemade chili recipe will do, of course, this is just my favorite. Make the guacamole. You can make this as fancy as you want, I chose to keep it simple. Mash 4 avocados in a bowl and add 3/4 teaspoon salt and lime juice to taste (about 3-4 tablespoons, or about 2 limes). Make the corn salsa. Let frozen corn thaw to room temperature. In a medium bowl, combine corn, 3 chopped tomatoes, 1 or 2 chopped jalapenos (to taste), chopped cilantro, chopped red onion, salt, and lime juice. Stir it together and adjust salt to taste. Make the queso. Break up the White American cheese into chunks and add to a small saucepan. Add 6 tablespoons milk and 1 tablespoon butter. Turn the heat to LOW. Cook, stirring frequently, over low heat until the cheese is melted and smooth. Add 1 teaspoon each cumin, garlic, and onion powder. Add 1/4 teaspoon crushed red pepper, or more if you want it spicy. Keep stirring occasionally over low heat until you are ready to assemble (the cheese starts to thicken as it cools). To assemble: Add tortilla chips to 4 large shallow bowls or plates**. Top with about 1 cup of hot chili. Drizzle the chips with the white queso dip. Top with a large scoop of corn salsa. Add a huge scoop of guacamole. Add a large dollop of sour cream. Sprinkle the whole thing with shredded cheddar cheese. Garnish with additional lime slices. *Not White cheddar cheese. Not Monterey jack cheese. Look at the label and make sure it says White American Cheese! Nothing else will melt like American cheese. I always get mine from the deli counter. If you can't find it, ask a clerk at the store. I promise they have it somewhere! 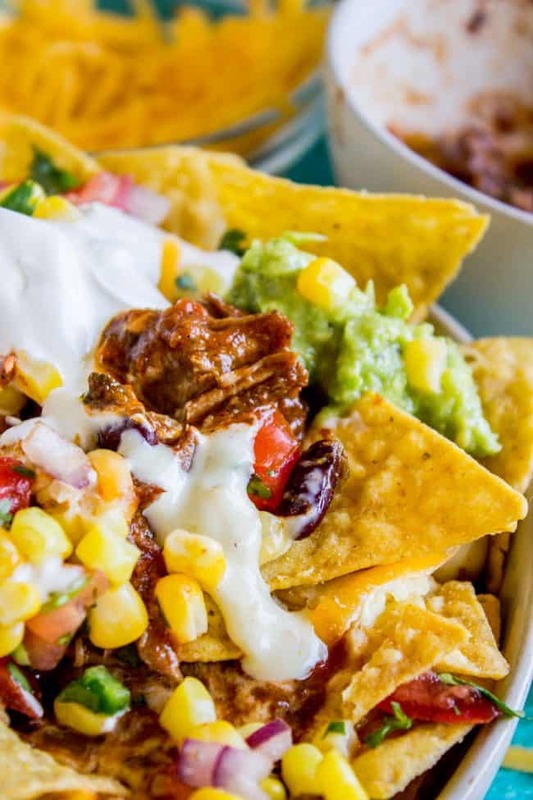 **Instead of serving these nachos individually, you could also line a large baking sheet with chips and put all the toppings on for people to dish it up themselves. You could also layer the chips, chili, and queso on a sheet pan, put it in the oven on the "keep warm" setting (170 degrees F) and pull it out when your guests are ready to eat. Serve the guac, salsa, and other toppings in bowls, and people can serve themselves.